The damning state of affairs was revealed in the House of Assembly (HoA), during its July 24, 2018, sitting by Premier and Minister of Finance, Dr the Honourable D. Orlando Smith (AL). According to the Premier, a confidential draft report had been submitted to the BVI Ports Authority management for their review and comments. He reminded of an earlier commitment that once the report was finalised and submitted to the Ministry of Finance, the House would be further updated. Dr Smith during the House’s July 24, 2018, sitting reported however, that the report’s completion has since been impacted by incomplete records and the separation of some persons who have significant knowledge of the project. 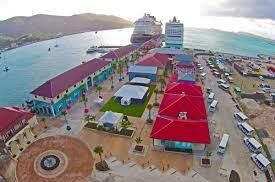 He said nonetheless, the initial report has also been submitted to the BVI Ports Authority’s parent Ministry, the Ministry of Communications and Works for its comments. These comments are yet to be finalized and as such, the Ministry of Finance is therefore yet to receive the final report. He said, at that time, Cabinet will then make a determination as to when the report will be made public. Many residents, the Opposition in the HoA and civil society continue to doubt the credibility of the Forensic Audit, when they have said that government should not be auditing itself. Those documents has been shreaded and burned at the local dump. The thieves who lined their pockets like any other thief would do thought, we got this. Always remember, one of the thieves in the bunch still have recipits. It is called if I go down, you are going down also. Investergators, don't let this end up under the rug. Just keep digging and you will find what you are looking for. I have a100% of all files and communications through April 1st 2014. I am still waiting on my payment for all fees related to the design of the project. What do you need? I have the line item budget of the project to be built under our agreement for a guanteed $45 Million. But he when the Minister and First caribbean saw they had $90 million guarantee they pushed us out, corruption came in then you spend $87 million. Just follow the money. OK, Consultants too often bend towards the needs/ bent of the client; of course, consultant are always in need of future work. The relationship between the government and consultant is too close. From the beginning, the Governor’s Office should have commissioned a commission of inquiry; it has belatedly done so. NOnetheles; in regards to the agency that is performing audit, should it not be interviewing people, collecting documents, compiling its findings and developing and submitting a report? Why does the Port or any other agency have to review the report before it is submitted? Is the purpose to sanitize the report; is it self-serving? Why are documents missing? Are they missing due to sloppy record keeping or other reasons? There is no excuse for being irresponsible. How ever you flip this. This is being irresponsible. Everyone who was involved with the Pier Park project should be hauled into Court. Heck, even the janitor who empty the trash should be hauled into court. I agree, complète iresponsibility. Which department or what persons are responsible for the missing documents? Some one has to be responsible and accountable. This is no excuse. What ever department heads or particular persons responsible for the missing documents should be endited immediately for questioning, and if proper answers are not given, should be retained for trial. This situation is not a joke. Despite the situation the country is in, these legislatures continue to hand out contracts to their friends without the proper procedures followed, without any concern for accountability. This is accountability time and they would no longer get away with this mess. Time is up, shape up or ship out. This is a hard one to swallow. The former governor could have called for an inquiry on the project and he refused, referring to gossip. Documents would have been found then. Whoever is responsible must be held accountable. The ministry must give answers. All who dealt with that project under the ministry must be answerable in the courts. We are talking about ax payers money. I worked on that job and to say all the records are gone IS LIES! MORE LIES.... all the purchase orders, sub contracts etc still exist! when will the NDP stop all the lies! Whoever you are, if you can prove this, then go public and speak up before the. British Feds start rapping at your door. I believe everyone who worked on that project is going to be hauled in soon. I did go to the powers that be and they had no interest in talking! If they want to talk they know who I am,. Pull in all the consultants NDP have hired and ask for their reports. TTP had one from St Lucia gone home now to build house and Tourism Board still have one paying sitting in StLucia . All this money on these so called consultants and things still a mess !